NAHA -- At the opening ceremony for the 32nd National High School Baseball Invitational Tournament at Hanshin Koshien Stadium in Japan's western Hyogo Prefecture, the team captain of Okinawa Prefectural Naha Senior High School, the first team from the southernmost prefecture since the end of the war, had a slip of the tongue. 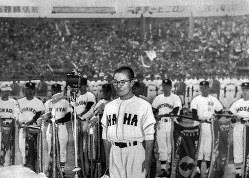 During the players' pledge, captain Seijun Makishi said, "Nineteen Sixty--Showa 35, April 1," revealing a complicated relationship between the residents of Okinawa Prefecture, who were under the rule of the U.S. military at the time and used the Western calendar, and the imperial era system used in mainland Japan. After Okinawa's return to Japanese sovereignty in 1972, Makishi died of pancreatic cancer at the age of 37 in 1980. In a note following the event, Makishi wrote that when he heard tournament chairman and Mainichi Newspapers Co. Chairman Chikao Honda greet the players, saying, "Should we not give a tremendous round of applause to these young men participating from Okinawa, which is still under occupation?" that "tears filled with deep emotion continuously fell." In the Mainichi Shimbun evening edition for April 1, 1960, the scene was described as, "Thunderous applause from 70,000 spectators: The Naha High School Nine seem to have been immersed in the same profound inspiration." Makishi's wife Aiko, now 70, said, "The pledge after that greeting, right? He must have been filled with a mix of emotions, and his mind must have gone blank with nervousness and thrill and the Western calendar years he was used to must have just slipped out." In an album carefully preserved by Aiko, there are handwritten comments by Makishi covering the pages. Under a photo of all the teams in the invitational tournament lined up, he even revealed, "I was probably a little bit scared!" In the several locations where the date of the opening ceremony appeared, Makishi had written, "1960...! Showa 35," showing that he was very much aware of his slip. His classmate Sumiko Ito, now 76, who was cheering from high in the stands that day, said, "I was saying to a friend, 'Why do we have to go out of our way to say Showa?' When I heard him restate it, I truly felt the difference between Okinawa and the mainland." Hosei University Institute for Okinawan Studies researcher Takashi Uezato, 42, explained, "The imperial era name system is a mark that the residents of that region are subjects ruled by that system." Western calendar years or Imperial eras -- The U.S. military or the Japanese government -- Makishi's pledge was a clear reflection of the conditions of Okinawa at the time. Under U.S. occupation, American authorities would forcefully seize land from Okinawan residents to ensure space for military use, in a method referred to as "bayonets and bulldozers." Sexual assaults on Okinawan women by U.S. military personnel occurred one after the other, and the anger and desolation of residents developed into a deep longing for the Japanese mainland with the war-renouncing Constitution. Sei Miyazato, 86, who worked for the civil "Ryukyu government" under U.S. occupation explained, "Under U.S. military rule where we had no rights, we thought we would be saved if only we returned to Japan." In protests calling for Okinawa's return to Japanese sovereignty, residents would wave the "Hinomaru" Japanese national flag, which was outlawed by the U.S. military. "You could say it felt good to wave the Hinomaru, and I felt like I had returned to my country," remembered Tomokazu Takamine, 75, former president of the local newspaper Ryukyu Shimpo, who was an elementary school student at the time. In January 1968, the Ryukyu Shimpo changed the way the year was printed from the Western calendar to the Imperial era system. The Western 1968 appeared in parenthesis with Showa 43. "It was probably the company's way to show its wish for Okinawa to be returned to the mainland," offered Teruo Okada, 78, head of the Ryukyu Shimpo Newspaper Museum. The Ryukyu government also decided at a gathering of senior officials on April 23, 1971, that the imperial era name system would be used on official government documents after Okinawa was returned to Japan. A Ryukyu government paper stored in the Okinawa Prefectural public document archives says that the new policy was conveyed to officials on June 1 the same year. The document stated that opinions for and against the adoption of the Imperial system existed, but "as part of an official system, the Imperial era name system (Showa) will be used in line with all of Japan's other prefectures." Hiroaki Nako, 75, who was in charge of administrative negotiations with the Japanese government in the Ryukyu government said, "They must have first wanted to be 'in line with the mainland' above all else." Within the Ryukyu government, he said, there was a feeling among his co-workers that "all the other prefectures were using it." Kurayoshi Takara, 71, a former vice governor of Okinawa and a University of the Ryukyus emeritus professor specializing in Okinawan history, explained, "There was a feeling in Okinawa of wanting to enter the umbrella of Japanese constitutional system to solve the problems under U.S. military occupation like bases and crimes by military personnel." By using the Imperial era system assuming that the Emperor decided the time, he said, they must have thought that it would validate them as members of Japanese society. But there were many Okinawans who felt mixed feelings toward the return of the imperial era system, which invoked Emperor Hirohito, known posthumously as Emperor Showa, and the Hinomaru flag, reminding the residents of the horrors experienced near the close of World War II. Still, to criticize Japan before Okinawa was returned was seen as taboo. "It's difficult not to say that it was an obstacle to call for Okinawa's return," explained University of the Ryukyus professor, 64-year-old Tsuneo Namihira, a specialist in the history of modern Okinawan politics. However, as the return of the islands approached and it became clear that the burden of U.S. military bases on Okinawa would not be lifted, residents' sense of disappointment grew. Japanese Prime Minister Eisaku Sato and U.S. President Richard Nixon agreed on Okinawa's return at a 1969 meeting, but it also became clear that the U.S. military presence on the islands would remain. Takamine, who joined Ryukyu Shimpo in 1970 and covered the return of Okinawa, said of the time, "It became clear that we wouldn't get a peaceful Okinawa free of military bases." After the Sato-Nixon meeting, the Ryukyu government was bombarded with paperwork from mainland Japan about how the islands were to come under the government, how laws were to be applied and other such topics, but the wishes of the people of Okinawa were all but ignored. A proposal containing all of Okinawa's wishes was submitted to Sato and the heads of both houses of the Diet in November 1971, but immediately before a bill related to Okinawa's return to Japan was rammed through the Diet's House of Representatives Okinawa reversion agreement special committee. On May 15, 1972 (Showa 47), Okinawa would be returned to Japan. Miyazato, who had once seen hope among members of the Ryukyu government in Okinawa's return to Japan, had a copy of the proposal on hand. Under the printed "November, Showa 46," he had written "November 1971" in red pen. "I must have written it out of my feelings of resistance," he said.